Metallica making decent headway on their new album, if Lars Ulrich's latest comments are anything to go by. Of the follow-up to 2008's Death Magnetic, the drummer told Rolling Stone: "We're about seven, eight songs into it. We do it in rounds. We come up with something, we leave it, go to the next thing, come up with something basic, leave it and circle back around. Next month we'll go back and start embellishing: 'Let's double that one part and come up with a middle bit.'" 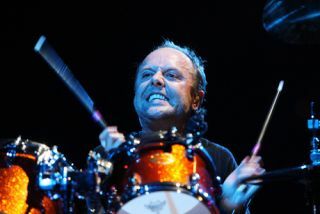 For more from Lars take a look at our recent interview with the drum world's favourite Dane, in which he discusses Iron Maiden, Lulu, the future of Metallica and more.